Phoenix Labs’ Dauntless is the free-to-play monster hunting game that’s been in open beta for just under a year now. When it launches on consoles this summer, Dauntless will also abandon its bespoke launcher and become an Epic Games Store exclusive (current players will have to opt in to have their Dauntless accounts merged with Epic Games Store accounts). Phoenix Labs says the decision came down to Epic’s willingness to sit down and talk with them, and the promise the publisher made to deliver more players. That includes building what Phoenix Labs calls a ‘One Dauntless’ experience, which will allow for cross-platform play between PC and consoles. But Burt said Epic has also been very transparent with Phoenix Labs, and there’s been a free flow of communication between the companies since the beginning, sometimes including daily calls. That’s not generally something that can be said of Valve. 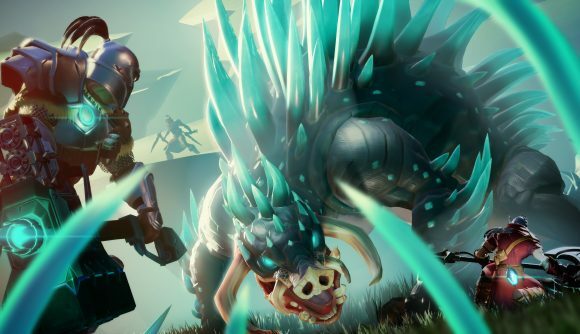 Epic has shared its download statistics with Phoenix Labs, and Burt said that’s led to the studio increasing its expectations for how much Dauntless is likely to grow this summer. Burt was quick to point out that his studio has no ill will toward Valve, but that Phoenix Labs has handled the full development-to-publishing process so far, and the partnership with Epic allows the studio to maintain some of that direct control. It’s beyond the better profit split Epic offers over Valve.